The Davy Crockett is the latest pellet grill from Green Mountain Grills. The legs on this pellet grill fold up to form handles so you can take this one with you. It will plug into a vehicle adapter, a 12 volt battery or a 110v wall outlet. 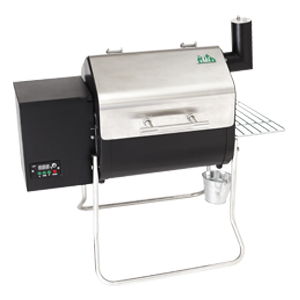 This little grill heats from 150 to 550 degrees which is a better range than our other GMG pellet grills which only go from 150 – 500 degrees.